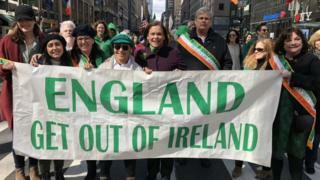 Sinn Féin president Mary Lou McDonald has been criticised after she posed with a banner reading 'England get out of Ireland'. Irish Tánaiste (Deputy PM) Simon Coveney described the banner as "offensive, divisive and an embarrassment". Sinn Féin said the criticism was "faux outrage" and "political point scoring". The photo was posted on Twitter by Sinn Féin's official account along with the caption "no explanation needed". Alliance Party leader Naomi Long told BBC Radio Ulster's Sunday News that politicians can "get giddy on the kind of high of hanging around with people in the Irish-American lobby who perhaps don't see the subtle distinctions that we are aware of back home". "I think that anti-English sentiment, Anglophobia, is one of the last permissible kinds of xenophobia that we accept. And I don't think it's good enough." Ulster Unionist leader Robin Swann called for an explanation, and said the poster was "highly offensive and wrong on so many levels". "It is sad that whilst others celebrate St Patrick in a respectful and non-confrontational manner, Sinn Féin returns to type," he said. "For instance, Omagh Protestant Boys Melody Flute Band took part in the Sgt William Jasper Memorial parade in Savannah, Georgia, organised by the US military and including bands from the US Army and US Marine Corps. "The band was warmly received and awarded the Joseph Ramsey Cup for the best band in parade." DUP MP for East Londonderry, Gregory Campbell, said: "When slogans such as "Brits out" or "England out of Ireland" are used the unionist community are well within their rights to see themselves as the intended focus. "Like truth and respect, explanations are demanded, but never offered by Sinn Féin." SDLP leader Colum Eastwood retweeted the image and said: "Sinn Féin aren't capable of convincing unionists of anything. The rest of us will have a lot of heavy lifting to do." A Sinn Féin spokesperson said: "The most divisive and offensive act on this island for almost the last 100 years has been the partition of Ireland. "It should come as no surprise that Sinn Féin wants a new United Ireland under the provisions of Good Friday Agreement. "The faux outrage of some of our political opponents owes more to the silly season of a holiday weekend and petty political point scoring. Former Victims' Commissioner Patricia MacBride told BBC Northern Ireland's Sunday Politics programme she understood the sign gained prominence in New York in the early 1980s. "I think it came to the fore during the daily protests outside the British Consulate in New York City during the hunger strikes in 1981," she said. "I think the sign was very much of its time and needs to be consigned to history at this point in time and moving forward." Image caption Patricia MacBride said the sign "was very much of its time". Ms McDonald was one of a number of politicians from Northern Ireland and the Republic of Ireland who were in the United States for a range of events in the run up to St Patrick's Day.